A truck driver spends most of their time on the road traveling from one destination to another. This means that their fuel usage is well above the average driver. 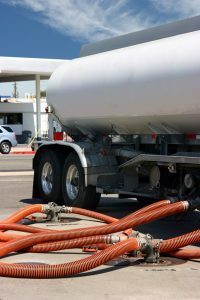 Gas prices fluctuate and can become a very high expense for truck drivers. Here are four fuel-saving tips to help truck drivers save some time and money. Following the rules of the road can actually help to conserve fuel. The biggest thing that affects fuel usage is the speed of the vehicle. Your engine works harder when the truck goes faster, burning more fuel than it would if you were going slower. With that being said, it is best to drive the speed limit which not only saves fuel, but also keeps you safer on the road. You also want to avoid unnecessary idling because that can use a lot of fuel as well. Turn the engine off when you aren’t using it and use cruise control to help save fuel. When you are in stop and go traffic, your truck uses a lot of fuel to begin moving again after coming to a complete stop. Truck drivers should be aware of traffic conditions and prepare to slow down and stop in advance to save some fuel. If you anticipate traffic, you may just have to slow down rather than coming to a complete stop every time. If your truck is manual, this also helps reduce the amount of gear changes needed which can help to save fuel. Heavy, sudden braking also burns more fuel than a gradual stop. You want to use the motor oil grade that is recommended by the truck’s manufacturer. This is a simple solution to help improve your truck’s gas mileage. When it’s time to fill up your tank, do so early in the morning to help save some fuel and pump the fuel at a low setting. Using premium diesel fuel can also help to save some fuel. You want to fill up your tank before it becomes fully empty because the fuller the tank, the more mileage you get. Keeping your truck in good shape is a great way to save fuel. Things like low tire pressure and a bad drive alignment can cause your truck to burn more gas than it needs to. You want to regularly check air coolers for any possible leaks. Always replace old fuel injectors and consider an engine overhaul if your engine is old as well. Getting your truck professionally serviced and maintenanced regularly helps to increase the lifespan of the truck altogether while also saving some fuel. This entry was posted on Friday, August 3rd, 2018	at 7:12 pm	and is filed under Trucking Lifestyle	. You can follow any responses to this entry through the RSS 2.0	feed. Both comments and pings are currently closed.